Figure 1. 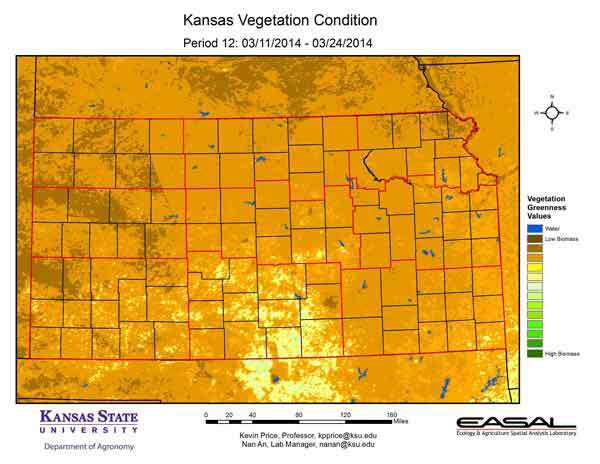 The Vegetation Condition Report for Kansas for March 11 – 24 from K-State’s Ecology and Agriculture Spatial Analysis Laboratory shows that vegetative activity is very low. The greatest activity is seen in in Harper and Sumner counties, where winter wheat is more advanced. Figure 2. 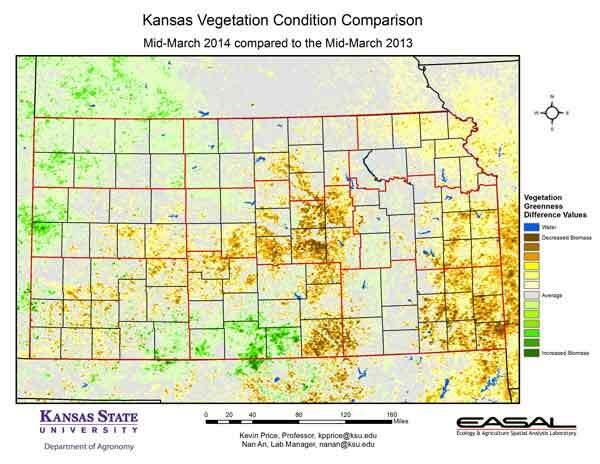 Compared to the previous year at this time for Kansas, the current Vegetation Condition Report for March 11 – 24 from K-State’s Ecology and Agriculture Spatial Analysis Laboratory shows NDVI values are lower in the Central Division and in the Eastern Divisions. Southeastern Kansas, in particular has much lower values. Last year, precipitation was just more than normal for the year-to-date. This year, precipitation is only 35 percent of normal. Figure 3. 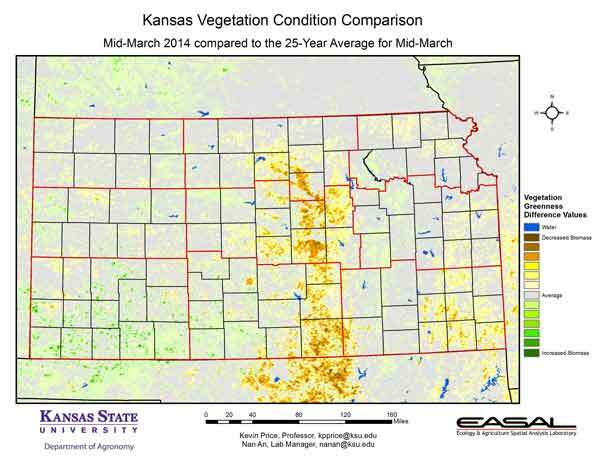 Compared to the 25-year average at this time for Kansas, this year’s Vegetation Condition Report for March 11 – 24 from K-State’s Ecology and Agriculture Spatial Analysis Laboratory shows the biggest departure is in the Central Divisions. The combination of cooler-than-average temperatures and dry soils has slowed plant development relative to the 25-year average. Figure 4. 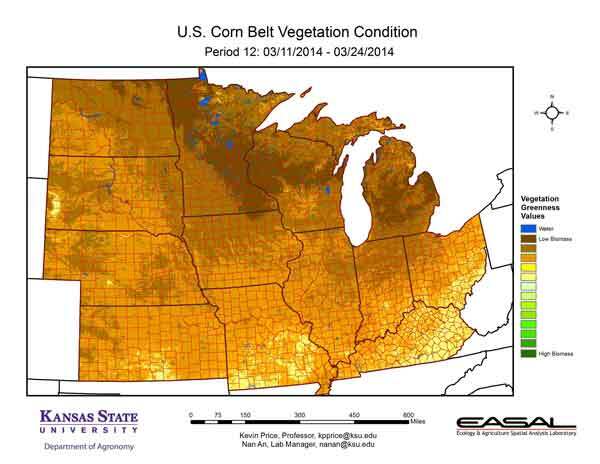 The Vegetation Condition Report for the Corn Belt for March 11 – 24 from K-State’s Ecology and Agriculture Spatial Analysis Laboratory shows that vegetation is just beginning to be active across the southern and eastern portions of the region. The darkest areas are those which still have significant snowpack. Temperatures continue to be below average across the region. Figure 5. 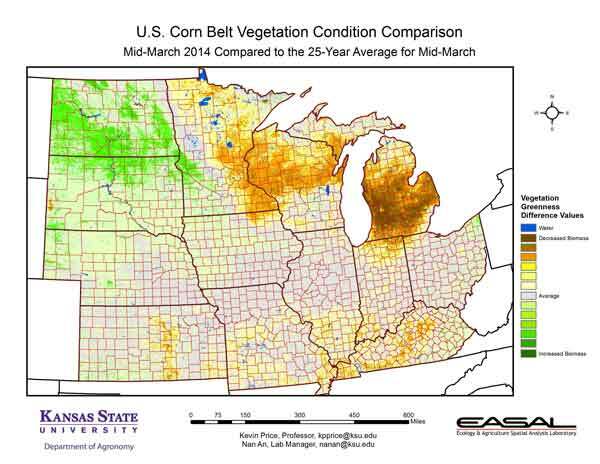 The comparison to last year in the Corn Belt for the period March 11 – 24 from K-State’s Ecology and Agriculture Spatial Analysis Laboratory shows an area of increased plant activity across North Dakota into northeastern South Dakota and parts of Minnesota. While snow is still a factor, the coverage is less than last year. Figure 6. 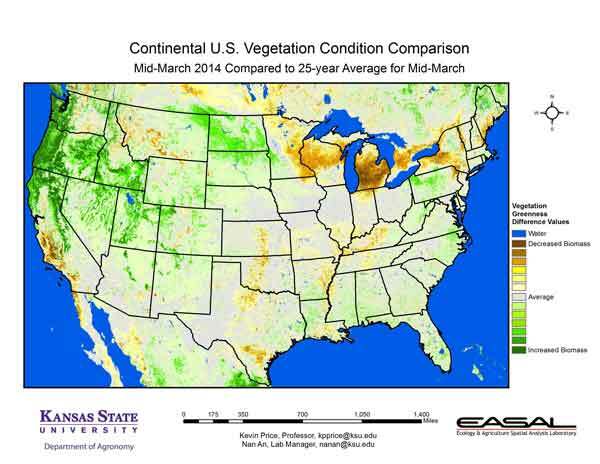 Compared to the 25-year average at this time for the Corn Belt, this year’s Vegetation Condition Report for March 11 – 24 from K-State’s Ecology and Agriculture Spatial Analysis Laboratory shows that the cold weather and consistent snowpack continues to reduce vegetative activity. The greatest area of above-average activity is in the western portions of the region. The area of snow coverage in North Dakota is less than half of what it was last year at this time. Average depth is less than 3 inches, whereas last year this area had an average depth of 11 inches during this two-week composite period. Figure 7. 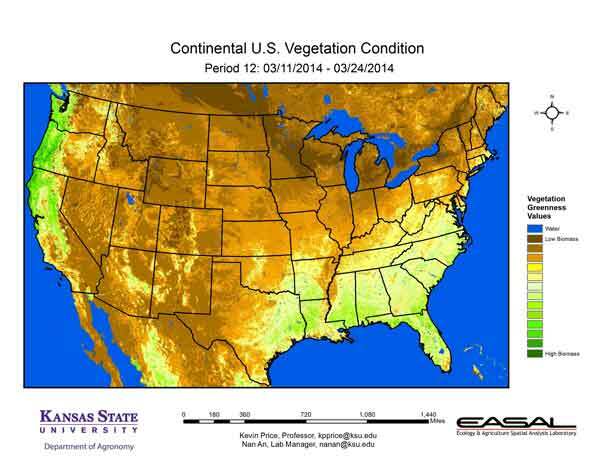 The Vegetation Condition Report for the U.S. for March 11 – 24 from K-State’s Ecology and Agriculture Spatial Analysis Laboratory shows that most of the vegetation is still dormant. Areas of lowest biomass productivity in the Great Lakes region correspond to areas with heaviest remaining snow cover. Despite the high biomass productivity in Northern California, that region remains in severe to extreme drought. Figure 8. 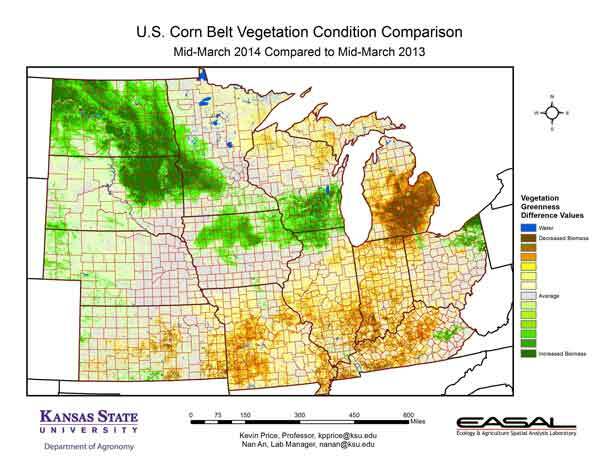 The U.S. comparison to last year at this time for the period March 11 – 24 from K-State’s Ecology and Agriculture Spatial Analysis Laboratory shows that the greatest increase in vegetative activity is in the Northern High Plains. Snow cover in this area is less than a third of what it was last year at this time. Figure 9. The U.S. comparison to the 25-year average for the period March 11 – 24 from K-State’s Ecology and Agriculture Spatial Analysis Laboratory shows that higher-than-normal vegetative activity is most concentrated in the Pacific Northwest. March rains in Washington and Oregon have reduced drought in those states.